Avengers: Infinity War is set to be the biggest superhero movie of all time – if not the biggest movie of all time. The cast list alone is staggering: Robert Downey Jr, Scarlett Johansson, Benedict Cumberbatch, Mark Ruffalo, Chris Hemsworth, Chris Pratt, Josh Brolin, Zoe Saldana, Chris Evans, Tom Hiddleston and even more A-list stars than we have space to mention. Rumours suggest that Infinity War, and its unnamed sequel, cost an astonishing $1 billion. However the mega-budget isn't the real talking point, and what Marvel have achieved, starting with Iron Man in 2008, is unprecedented. It might now seem like superhero movies have taken over the box office but 10 years ago, it was a hugely risky experiment. Now, through, Iron Man, Captain America, Thor, Black Panther, Doctor Strange and Guardians of the Galaxy, Marvel have created their own interconnected universe across 18 movies. Each film is part of a huge unfolding story – not forgetting numerous TV shows and series all taking place within the same fictional world – that culminates here in the third and fourth Avengers' movies, as the world's greatest heroes take on ultra-bad guy Thanos. We know there are more Marvel movies on the horizon but Joe Russo (who co-directed Infinity War with his brother Anthony) keeps hinting that this is a an end point, the 'final chapter' in this superhero epic that has spanned the galaxy. And what's perhaps most surprising is that part of this megalithic blockbuster was filmed in Edinburgh. One of Joe's kids went to University in Scotland so he already knew the city and spotted its potential as a filming location. As a thank you to the city, Joe Russo presented film fans with a 20 minute exclusive sneak peak of Infinity War and we sat down with him to find out more. You and your brother were best known for comedy, so how did you first get involved with the MCU? My brother and I grew up loving dramas and comedies, we had a steady diet of foreign films and art house movies. We were very fortunate that we won an Emmy for Arrested Development, and when you win an award in a certain genre, people turn to you for that genre consistently. So we'd built a comedic empire in television and had a lot of creative control working on shows we love: Arrested Development, Community, Happy Endings. We'd made these two paintball episodes in Community that were action spoofs. [Producer] Kevin Feige from Marvel saw those episodes and said 'I think you should be making action movies, do you want to come in and talk about Captain America?' And being comic book fans we said 'of course' and that's how it started. And as a comicbook fan who was your favourite superhero? Spider-Man. So being able to introduce him in [Captain America] Civil War was a dream come true. What I loved about him as a character growing up is that he's a teen struggling with great power, but he'd only been played by adults in movies. So it was really important for us to cast Tom Holland because I wanted somebody who felt like the character I knew as a child. I think it gives it a different energy and quality. Considering the secrecy, what can you tell us about Infinity War? My brother and I have worked really hard to protect the secrets on this movie. A lot of people have invested ten years of their lives in these films, some people grew up on them, and this is the ending. And we don't want anyone spoiling the ending. We wrote fake scripts, we gave them out to the actors, nobody really knows the truth, nobody really knows what happens in the film. After we put all that energy into protecting those secrets, we certainly aren't going to say too much about the movie. It must be hard getting so many actors in one place at the same time. Without question, that was the reason we had to do both movies at the same time. We were going to block them off for a year and it's very difficult to get them all together. Basically we shut Hollywood down for a year because everyone was working on this. Did you enjoy working with such a huge cast? It was great, these people have worked together for a decade, there are a lot of strong relationships. We've worked with most of them the last seven years so it's a little bit like summer camp, everybody gets along really well – we have a lot of fun on set, we laugh a lot. It was a great experience. Downey's great at breaking the tension, he started the universe and everyone really looks up to him. He's the greatest actor of his generation and somebody who's very warm and inclusive. Knowing this was the ending was bittersweet. A film of this size must have been incredibly complex to shoot. I think this might be one of the most complicated movies ever made from a scale stand point. Not only the scale of the cast – and this could easily be pound for pound the most movie stars in a film ever – but taking all these incredibly successful franchises and merging them together with all these stories told across a massive cosmic landscape and fantastical settings with cutting edge CG. 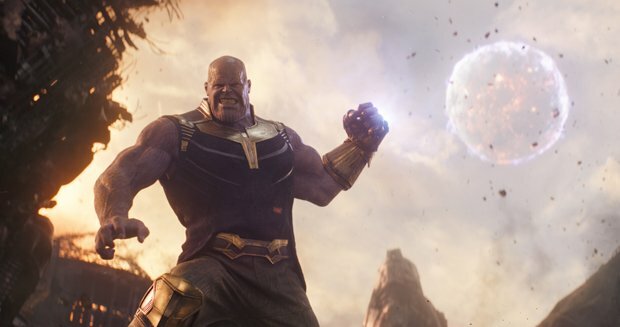 The techniques used to bring Thanos to life are the absolute cutting edge of technology. We've seen these heroes saving the day across 18 films now, so how did you make Thanos a credible threat? He's a very unique creature. He's a genetic mutation, a one in gazillion genetic freak born on a planet called Titan with virtually invincible skin, he's stronger than the Hulk and he's genius level intelligence. He's like the Genghis Khan of this universe. So he's a very scary character, he has an incredible will, he's charismatic, he's sociopathic and he doesn't have a lot of flaws so I think it's going to cost the characters a lot to beat him. What brought you to Edinburgh to film? I love this city, I've spent a lot of time here, it's beautiful. I'm surprised it hasn't been on film more, shocked frankly, because it's one of the most beautiful cities in the world and at night it can take on a gothic feel. And we had a sequence we wanted with heightened tension and it was a perfect place to shoot that scene. Inevitably in a film of this type there must be a lot of green screen involved but do you find filming in real locations easier? Without question. Any time you can put actors in a real location it's tactile, they can feel it, they can see it, they can smell it. It's very difficult when you are trying to get a performance out of an actor and they are standing on a stage in green screen, they don't know where they are or what they are looking at. We try to go practical as much as we can but this is a very fantastical movie. Thanos is a cosmic character so there are a lot of cosmic locations so it wasn't always the case. Finally is there anything at all you can tell us about Avengers 4? Frankly no. Marvel has been writing a book for the last 10 years and this is the final chapter. This is it. If you have been following along for the last decade this is the movie to see, this brings it all together and brings it to a close. Avengers: Infinity War on general release from Thu 26 Apr.